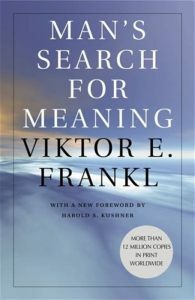 In this excellent mind-turning book, Viktor Frankl writes about the deeper meaning of life, and how important this is to all of us. Having lived through one of the toughest experiences in history – being in the holocaust, where people were murdered systematically – he found that people whose life had meaning survived (I’m obviously over-simplifying, but that’s what’s in my memory). And how does one arrive at meaning? “As logotherapy teaches, there are three main avenues on which one arrives at meaning in life. The first is by creating a work or by doing a deed. The second is by experiencing something or encountering someone; in other words, meaning can be found not only in work but also in love… Most important, however, is the third avenue to meaning in life: even the helpless victim of a hopeless situation, facing a fate he cannot change, may rise above himself, may grow beyond himself, and by so doing change himself. He may turn a personal tragedy into a triumph.” Meaning can be both external and internal. Did I say it is a great book? Get it from your favorite online store and enjoy. Again and again I therefore admonish my students both in Europe and in America: “Don’t aim at success—the more you aim at it and make it a target, the more you are going to miss it. For success, like happiness, cannot be pursued; it must ensue, and it only does so as the unintended side-effect of one’s dedication to a cause greater than oneself or as the by-product of one’s surrender to a person other than oneself. Mental health is based on a certain degree of tension, the tension between what one has already achieved and what one still ought to accomplish, or the gap between what one is and what one should become. What man actually needs is not a tensionless state but rather the striving and struggling for a worthwhile goal, a freely chosen task. What he needs is not the discharge of tension at any cost but the call of a potential meaning waiting to be fulfilled by him. What man needs is not homeostasis but what I call “noö-dynamics,” i.e., the existential dynamics in a polar field of tension where one pole is represented by a meaning that is to be fulfilled and the other pole by the man who has to fulfill it. Suffering ceases to be suffering at the moment it finds a meaning, such as the meaning of a sacrifice. To the European, it is a characteristic of the American culture that, again and again, one is commanded and ordered to “be happy.” But happiness cannot be pursued; it must ensue. One must have a reason to “be happy.” Once the reason is found, however, one becomes happy automatically. People have enough to live by but nothing to live for; they have the means but no meaning. The fact remains that meaning, and its perception, as seen from the logotherapeutic angle, is completely down to earth rather than afloat in the air or resident in an ivory tower. Is this to say that suffering is indispensable to the discovery of meaning? In no way. I only insist that meaning is available in spite of—nay, even through—suffering, provided, as noted in Part Two of this book, that the suffering is unavoidable. If it is avoidable, the meaningful thing to do is to remove its cause, for unnecessary suffering is masochistic rather than heroic. If, on the other hand, one cannot change a situation that causes his suffering, he can still choose his attitude.